In 2011, the year that I graduated, a lot happened. 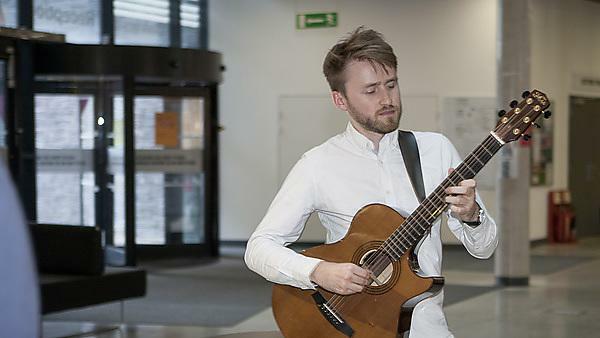 Along with completing my final year as a product design student, I won UK Acoustic Guitarist of the Year, as well as being made a fellow of Trinity College London in Guitar Recital. Since then, it’s been all about music-making, but my degree in design has helped enormously with many aspects of my professional life. It’s certainly developed. I’ve found myself being able to specialise more in the areas that I’m most interested in, like the development of the creative side of acoustic guitar repertoire and performance. Probably time-management as, being predominantly self-employed, the temptation is to say ‘yes’ to as much as possible and to fill in every spare moment with some form of work. It became evident pretty quickly that that way of doing things leads to total burnout before too long. Time off is incredibly important, but striking the balance is very hard sometimes. Heading over to Zimbabwe to perform as part of the Harare International Festival of Arts was particularly awe-inspiring. There was an amazing smorgasbord of styles and cultures all working together: it’s what music is all about. I would probably have made even more of the cross-collaboration potential at Plymouth and may have tried to collaborate on projects in other departments as well. Persistence is key, and don’t lose sight of why you’re doing it all in the first place. The cross-collaboration between departments was a fantastic thing. Being actively involved in the music department and the theatre and performance department alongside my degree in design gave me the opportunity to be introduced to people and ideas which have shaped the musician I’ve become today. Along with all the wonderful people I met, the three University trips I went on were particularly special: visiting Barcelona, Berlin, and New York with the design team were incredible experiences. I certainly do. I’ve remained close with a number of friends from the 3D design course and the music course, and often check in with lecturers such as Roberto Fraquelli, the Head of Design (who even comes to watch a gig or two when I’m nearby). Also, ties with the University arts organisation, Peninsula Arts, have been invaluable; I have remained in touch with Simon Ible who helped me a great deal musically during my time in Plymouth. I would definitely recommend undertaking a course at University of Plymouth, mainly because I so enjoyed the cross-collaboration between departments. I never felt isolated in one department, and I had total freedom to explore any ideas across departments if I felt that it would further my education and development in both design and music. For more information about studying design, please visit our BA (Hons) 3D Design and MA Design pages. For more information about our range of courses within the School of Art, Design and Architecture, please visit the school page. If you would like to find out what other alumni from the Faculty of Arts and Humanities are currently doing, please visit the architecture, design, building and construction interest area.